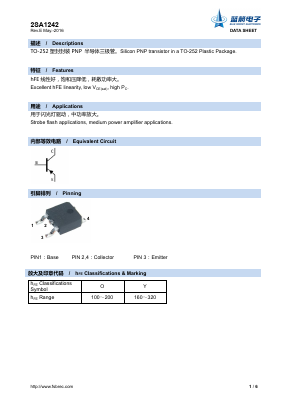 2SA1242 Datasheet PDF - Foshan Blue Rocket Electronics Co.,Ltd. Silicon PNP transistor in a TO-252 Plastic Package. Excellent hFE linearity, low VCE(sat), high PC. Strobe flash applications, medium power amplifier applications.